Have you ever played Golden Axe, and thought… “This is pretty poop, what we need is Aliens and guns”? Well, in case you were wondering, this is what Alien Storm is. 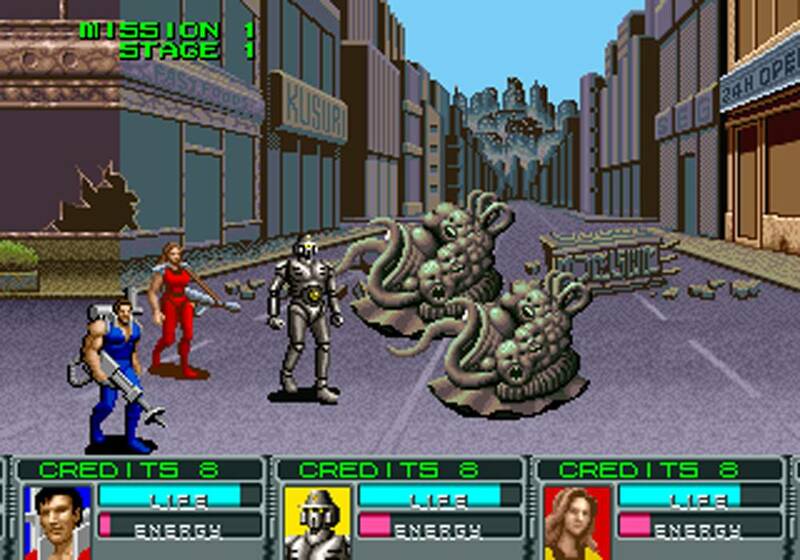 Golden Axe, with Aliens, and Guns. I have basically summed the game up already, and the short answer is YES. 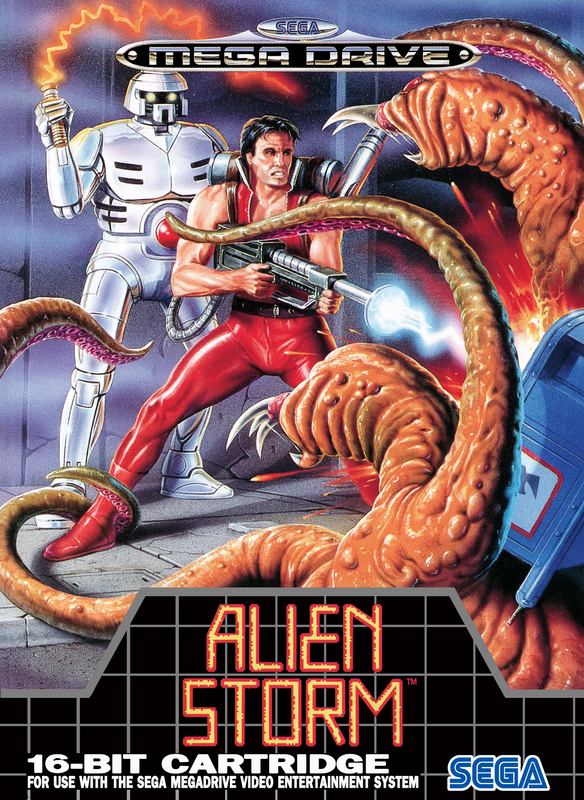 Yes, Alien Storm is better than Golden Axe. The premise is simple, aliens have invaded Earth, and the only thing that can stop them is you the “Ghost Alien Busters”. 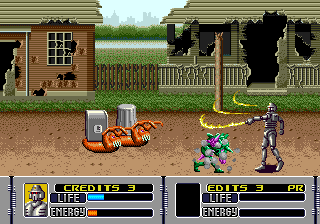 The Ghost Alien Busters team is made up of three members, and depending on which region or platform you played this on the characters will be slightly different. Karen, or Karla, who has a flame thrower, who can either be wearing yellow or red. Garth, or Gordon, who has a lasergun, and wears red or blue. To be honest, I played for a few hours, and never noticed the names. It might be in the manual, but they don’t really push the plot. Aliens attack, you go off and kill aliens. Unlike Golden Axe, there is no world screens, so you don’t get a funky map charting your journey. You get some else, something MUCH better. There is a first person gallery shooting mode! When I first played this game back in the early 90’s these sections blew my mind, they were by far the coolest thing I had ever seen, and I have always remembered it fondly. Taking off the rose tinted glasses for a moment though, it is worth pointing out that these sections are stupidly easy, or annoyingly hard. The graphics hold up well, and the sound is pretty decent, but the difficulty spikes, and employs standard arcade cheap hits tactics. There are points in the first person mode, where unless you have memorised the level enemies will pop out and hit you, some pop out, pretend to hit you, and run away, while another enemy actually hits you. It is a little confusing, and does require some level memorisation to get though unscathed. Like Golden Axe/Streets of Rage, you get a “special”, “attack”, and “jump” button. You can run and charge and run and jump over things, but unltimetly, you’re restricted to basic movesets similar to the aforementioned games. You collect energy throughout the level, which provides you with ammo for your gun. WARNING, YOU CAN RUN OUT. If you over use your special (which uses up energy) too many times, you’ll find yourself a little screwed. As once you run out, you are stuck with a pistol whipping aliens to death. There is no camp fire scenes like in Goilden Axe, instead, some enemies drop energy. The main source of replenishment is in the first person mode, where you’ll get the scant health pick ups, and a fair few enegy capsules to top up your special meter. 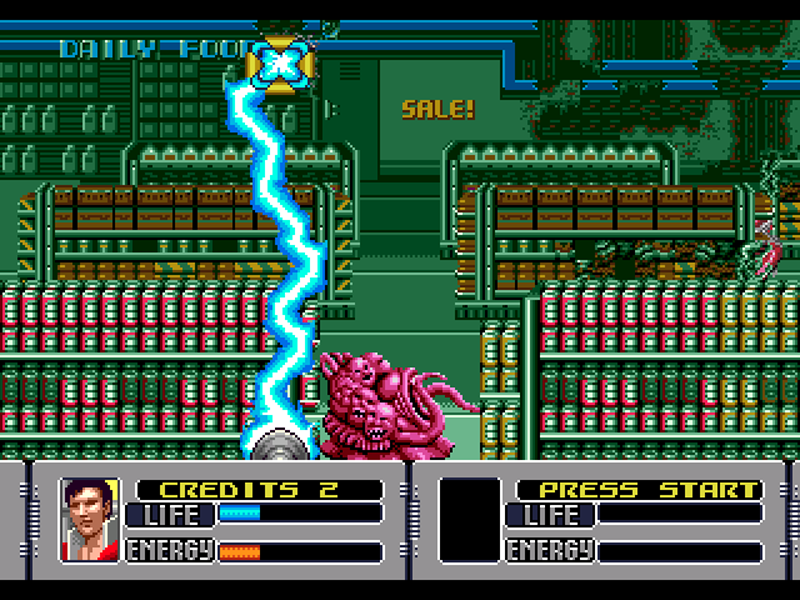 Alien Storm is bloody short, it took me 30 minutes to complete it, and I hadn’t touched this game in 20 years. The music is ok, but to be honest I didn’t really notice it. The game is definitely worth playing, but isn’t going to show you anything new. I prefer this to Golden Axe, and Double Dragon 2, but is perhaps inferior to Streets of Rage, but is certainly worth a play. You can get it on Virtual Console for WII, or you can get it on Mega Games 3 for Genesis (or single cartridge), as well as the other consoles of the era. I’d be interested to hear your thoughts on the Master System version, as I did play it as a kid, but don’t remember anything, execpt it being harder. I adored this game. I particularly liked the chase segments. First time I played the first person segment I thought I could burn the whole screen by keeping the target at the top but of course it didn’t work (I was 10 ok). I never knew there was an SMS version until recently. I am trying to find it for my collection. I know i’m late, just poking around remembering the video games from my youth. Spot on review.